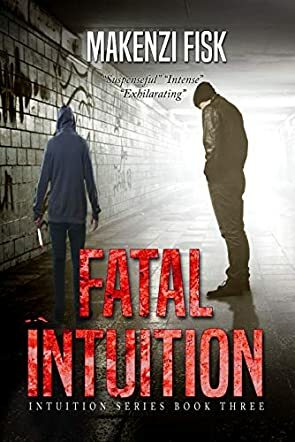 Fatal Intuition by Makenzi Fisk is an amazing thriller novel about the horror caused by a psychopathic teen. Erin has left the police force in Morley Falls and is now in training for the FBI. Ever since Lily stabbed her, Allie's ability to feel Lily's emotions and see into Lily's mind has increased. Although Lily is in Juvenile Detention in Canada and far away from Minnesota, the darkness that emanates from her is assaulting Allie's senses. To increase her anxiety, Lily keeps sending Allie physical reminders that she hasn't forgotten her and is coming for Allie as soon as she is released next year. Then the unthinkable happens, the evil is unleashed and in its wake bodies are being found over the northern states between Utah and Canada. Erin has joined the FBI in their hunt to stop it. Allie feels the darkness approaching and realizes that she and her loved ones are at risk. Erin is far away, working with the FBI, unable to be there to protect them and unable to find concrete proof that the danger is heading towards her own home. Will Allie's gift be enough to keep her and those that she loves safe? Will Erin make it home in time to save them? Lily is back! Makenzi Fisk has done it again! Fatal Intuition by Makenzi Fisk is the outstanding third book of the Intuition series. Here is another spine-chilling thriller with Lily, Allie, and Erin! Lily once again wreaks havoc in the innocent lives of others. Once I picked up the book, I was compelled to finish reading it before I could put it down. It combines all the characters and plots from the first two books and brings it to a nice conclusion, giving the reader closure. The plot thickens until the grand finale and a surprise ending. The novel was awesome. I am so glad that I was able to read it. It brought closure the way an excellently written book should. This is a story filled with suspense and violence. I recommend it to anyone who loves a spine-chilling thriller and for readers of LGBT fiction. Due to the violence, this book is more suitable for a mature reader.